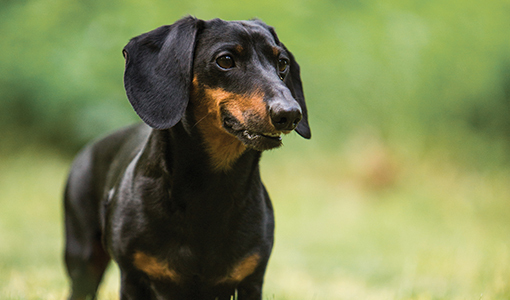 Nothing prepared Leslie and George Devol for the Cujo-like behavior of their dachshund Otto. The sweet puppy they brought home had morphed into a snapping, snarling dog 18 months later. The experienced dog owners couldn’t pet Otto, pick him up or put a collar and leash on him. They tried working with an animal behaviorist, then a dog trainer, but the tips they received seemed to make Otto worse. After reading the book Dogs Behaving Badly, by Nicholas Dodman, director of Cummings School’s Animal Behavior Clinic, the Devols drove from their home in New Canaan, Connecticut, for a consultation. “We had to put Otto in the back seat and barricade him away from us, like a vicious animal,” says Leslie. Dodman and his colleague, veterinarian Stephanie Borns-Weil, V07, got to the root of the problem. Otto had what is known as conflict aggression, which had been brought on or exacerbated by pain and chronic discomfort. With this type of behavior problem, dogs that are anxious about unpredictable interactions—say their owner reaches down to stroke them or pick them up—overreact in order to control the situation, says Borns-Weil. Otto needed two disc surgeries to correct his back pain and dermatology care for a miserable itch. The Tufts veterinarians started Otto on the antidepressant Prozac. “The medication greatly helps with impulse control, almost as if it lets dogs think for a moment about whether an interaction is really that much of a threat before they react,” says Borns-Weil.